The Standing Rock struggle did not emerge in a vacuum. In recent years, movements against fossil-fuel extraction have helped revive and, to some degree, reinvent North American environmentalism, with indigenous people frequently at the forefront. There has been strong opposition to nearly any infrastructure project associated with the Alberta tar sands and Keystone XL pipeline, along with widespread resistance to new coal infrastructure and extraction techniques such as fracking and acidization. Some campaigns have succeeded by targeting the fossil-fuel industries' greatest Achilles heel: shipping. Three of the largest and potentially most lucrative fossil fuel sources in North America—the Alberta tar sands, the Powder River coal basin and the Bakken oil shale basin—are located in the middle of the continent, far away from refineries, processing plants and shipping hubs. In effect, they are landlocked. Grassroots opposition to Keystone XL led President Barack Obama to veto the project in 2015. And opposition by some of the most systematically disenfranchised people in North America—western Canada's indigenous people—was the main obstacle to the completion of the equally massive Northern Gateway pipeline. An indigenous-led encampment protesting the Keystone XL pipeline also took place in 2013–14 at the Rosebud Sioux Reservation in South Dakota, a little over a hundred miles from Standing Rock. Bob Gough, a longtime resident of the Rosebud Reservation, said the Keystone fight had given indigenous people in the area "something to rally around, especially younger people here." From the perspective of many indigenous people at Standing Rock, their role in opposing fossil-fuel extraction marks another chapter in a struggle that has lasted for more than 500 years. For many, it is also part of a spiritual awakening and revitalization of traditional culture that was foretold generations ago. 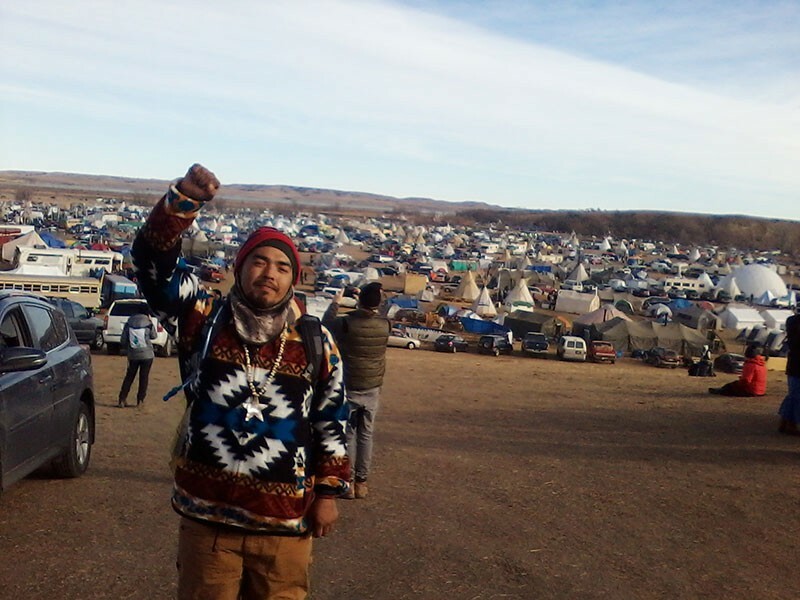 FRONT LINE Loren Lincoln, a Wailaki from the Round Valley Indian Tribes in Mendocino County, journeyed to Standing Rock. On Dec. 29, 1890, the 7th Cavalry Regiment massacred around 300 Lakota children, women and men near Wounded Knee, S.D., in what many historians see as the grisly final chapter in America's Manifest Destiny period. The massacre symbolized to the Lakota the shattering of the Sacred Hoop, the traditional circle of the Oceti Sakowin, representing the unity of the Seven Council Fires of the Lakota Nation. "My understanding is that the movement at Standing Rock is the fulfillment of multiple prophecies that involve our people coming together, standing up and mending the sacred hoop," Villagomez says. As of this writing, at least 2,000 people remain camped at Standing Rock in spite of snowy conditions and North Dakota's punishing winter winds, which blow clear down from Canada. The Dakota Access Pipeline is more than 90 percent completed, but construction adjacent to Standing Rock remains on hold thanks to the Army Corps of Engineers' recent directive. Most Water Protectors are fully aware that Donald Trump's administration is committed to seeing the pipeline completed, and that the Army Corps could reverse itself once he's in office. The Army Corps' directive delays, but does not cancel, the project. In the meantime, people across the country have launched divestment campaigns targeting the multiple banks that are financially fueling the pipeline's construction (see "The Spigot," Oct. 26). People in San Francisco, Santa Rosa, Ukiah and Clearlake have recently held protests at Wells Fargo, which is among the pipeline's major creditors and is the main banker of Energy Transfer Partners, to encourage customers to close their accounts there. They have also targeted other financial institutions like Citibank. Wells Fargo corporate communications director Jessica Ong told the Bohemian in October that the bank invested in the pipeline only after concluding there was low risk of social or environmental harm. In court filings, Energy Transfer Partners representatives have claimed that their contracts with the nine companies that have agreed to pay them to ship oil through the pipeline expire on Jan. 1, but can be renegotiated. As I reported in October, one of these companies appears to be Oasis Petroleum, a major Bakken shale producer in which Marin County–based investment firm SPO Partners owns the largest stake of any investor. "If Oasis Petroleum has made a financial commitment to the pipeline, as it appears they have, it certainly raises questions about their complicity in the pipeline company's egregious behavior toward the Water Protectors," says Clark Williams-Derry, research director of the Sightline Institute, an energy-policy think tank in Seattle. "The moral pressure is on them to decide whether they are to be a party to Dakota Access' actions." Among those who participated in a November demonstration at Wells Fargo's Ukiah branch was Jassen Rodriguez, the Mishewal Wappo man who had tended the Seven Councils fire at Standing Rock. Two days later, he drove back out to Standing Rock, along with four family members, braving the snow and the ice of North Dakota's punishing late-fall. "We've been waiting for this a long time," he says. "We've got to keep up the momentum."